The chief of the Homeland Security Department has told members of Congress that the government is "on track" to meet Thursday's court-ordered deadline of reuniting hundreds of migrant children with their families, lawmakers who met privately with her said. Wednesday's assertion by Secretary Kirstjen Nielsen was greeted with open disbelief and anger, according to many of the roughly 20 members of the Congressional Hispanic Caucus — all Democrats — who attended. The private, hourlong meeting seemed to achieve little toward dousing lawmakers' criticism of how children taken from their parents are being handled. Nielsen also told the group, "I am not a racist," according to two of the lawmakers. One of them, Rep. Luis Gutierrez, D-Ill., said she made the remark after he told her she worked for a "racist regime." Gutierrez said she cited her friendship with the first lady of Honduras and other Latina women. Rep. Joaquin Castro, D-Texas, tweeted that she told the lawmakers: "I am not a racist. Nobody believes families should be separated." A spokeswoman for the Homeland Security Department was asked for comment and did not immediately provide one. After the meeting, lawmakers said Nielsen provided no statistics to support her assertion that the deadline for reuniting families would be met. "She said they believe they're on track" to meet the court deadline, said Rep. Jim Costa, D-Calif., one of several lawmakers who said she used that phrase to describe the status of reuniting separated families. "That's impossible. And we all said this to her," said Rep. Ruben Gallego, D-Ariz.
Gutierrez said he told Nielsen "she is committing crimes against humanity, that she is a child abuser" and that she is "an accomplice of Donald Trump's racist regime." U.S. District Judge Dana Sabraw in San Diego set a Thursday deadline for reuniting children age 5 and older who have been held by the government since their families were caught entering the country without authorization. 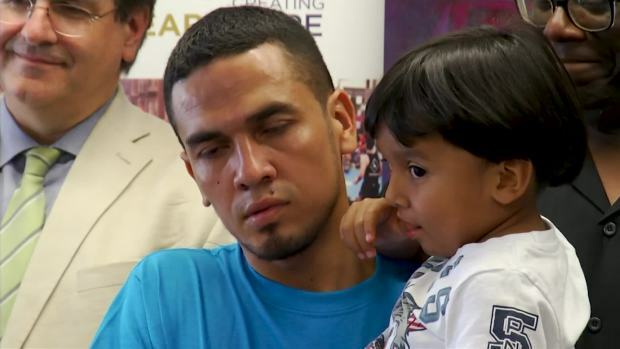 Two immigrant fathers who were separated from their young sons for almost two months following the Trump administration's "zero tolerance" policy have been reunited with their children in New York City. As many as 2,551 children age 5 and up were separated from their families and 1,187 children have been reunified with parents, guardians or sponsors, the government has said. The exact number still separated is unclear. The government has been releasing hundreds of families to faith-based groups, which are caring for them. The government has said 463 migrant parents may have been deported after being separated from their children, further complicating the reunification process. Sen. Robert Menendez, D-N.J., said Nielsen suggested to the lawmakers Wednesday that those children were left behind in the U.S. at those parents' requests. "We simply do not believe that's true," Menendez said. A separate deadline that Sabraw had set for reuniting around 100 children younger than age 5 with their families passed two weeks ago. Just over half have rejoined their parents or guardians, according to the latest figures. The separations caused a bipartisan, nationwide uproar against Trump's policy of "zero tolerance," in which the government prosecutes all migrants entering the U.S. illegally. 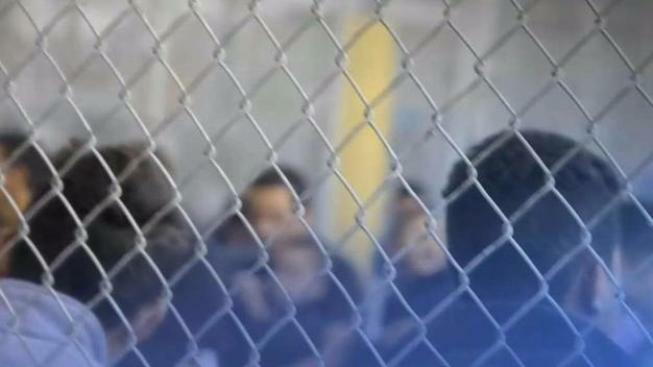 The government initially separated children from their detained parents or guardians. Under pressure, Trump abandoned the family separation policy, but hundreds of children remain apart from their parents in conditions that visitors have described as horrid. Nielsen ignored reporters' questions when she left the meeting. "Very productive. Very frank," she said. The lawmakers said Nielsen also told them her agency is financing the costs of detaining families with a 1 percent across-the-board cut to its programs. A Homeland Security spokeswoman said the added costs are due to increased numbers of people being caught entering the country, and the money is being used for additional beds and transportation expenses. Separately, the Republican-dominated House Appropriations Committee approved $5 billion for building parts of Trump's proposed border wall with Mexico after rejecting a Democratic effort to redirect that money to other immigration programs. Trump has requested the $5 billion for next year, but the Senate version of the bill financing the Homeland Security Department has just $1.6 billion. The final amount will need to be worked out later this year.